Oh boy! I’ve gotten so caught up in IA Summit and the rest of life, we’re already to four months since IA Summit 2014. One non-IAS thing from this past month: Tony and I checked an item off the bucket-list-we-didn’t-know-we-had. 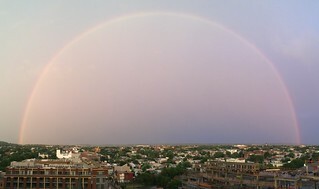 A rainy DC afternoon introduced us to the first full-arc rainbow we’ve ever seen. For the brief 10 minutes it graced the sky, I felt that sense of wonder that only nature can bring. I hope you one day get to experience the same thrill! Lots of web team collaboration. Resulting in the soft launch of our IAS15 site. Note that it’s stage one, so if you see something that needs improving or filling out, assume that we’re on it. My first reaction when considering an issue is to explore that issue. What’s the goal? Have we done something similar before? What are the constraints? How can we get around those constraints? I can often get behind more than one way to do something. When I’m on a team that’s collaborating equally, or one where there’s a specific leader, this works out relatively well. I spout out ideas (possibly trolling any detail, linear people with some off-the-wall ones) and then some or none of the ideas are used. But here’s what I’ve been finding on IAS: It seems that a leader spouting ideas can be easily misread as a micromanager. Folks then might feel a bit like they need to, I don’t know, run away and hide. And that makes it hard to get to part 3. I can’t blame them: There’s nothing that squashes my motivation and capabilities faster than someone saying, you must do it this way, at this time. I, too, want to run and hide from that leadership style. So, I’m practicing when to bring something up, and how to help folks know that I’m not trying to bulldoze them. If I come up with any rockin’ techniques, I’ll be sure to report back! Dani Nordin is our front-end developer. Welcome, Dani! That’s all for now. For homework: If it’s summer where you live and it is raining, double check for a rainbow.